I’m constantly coming up with questions about sewing, regarding best practice, fabric choice or technique. I love that taking up dressmaking means I am constantly learning, but despite the books on my shelf, my dedicated Twitter account and several more knowledgeable friends, sometimes I’m left wondering and without answer. This has made me think that I would like to use some of my blog posts as a way of seeking advice, as well as sharing my making. Hopefully this will mean I remember to share tips or useful links as a means of exchange for recommendations. Today I have a couple of ‘tips’. One is a new online store I discovered and the other is a couple of new blogs I have come across and been amazed by this week. Perhaps you already know about them all, but this time last week I didn’t and I have enjoyed discovering each of them. It’s important to say that this post is by no means sponsored, affiliated or related in any way to anything I’m signposting. The store is Kats Fabrics, an eBay store whose wares include Liberty in pre cut lengths such as 2.4 or 3.2 metres, but at great prices. Last night I ordered this beauty, £24 for 2.4 metres. The blogs I’ve stumbled across belong to Roisin and Amy and I’m mentioning them both for the same reason. Both of these blogs showcase so many beautiful dresses and left me feeling completely in awe and inspired for the upcoming year. I will be checking back to see their latest makes frequently, as they both appear to be prolific sewists and bloggers, a perfect combination. You’ll notice that I’m so impressed by Roisin’s latest make that I’ve already ordered some identical fabric. Finally, on to my question. I’m pretty well stocked up on fabric at the moment, so I’m looking for patterns to do them all justice. Can you recommend a dress pattern that only calls for between 2 and 2.5 metres of fabric? I’m already looking forward to hearing what you come up with. Thanks for reading and enjoy your Sunday. Aww thanks for the shout out! I love regency rags on ebay too. Great bargains for viscose and jersey. 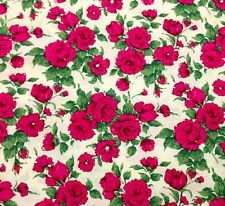 And for patterns I think a rose print cambie dress would be lovely. It only has one set of darts which makes it easy to adjust and a lovely full skirt. Or I love butterick 5351 for a beginner friendly sundress. AAh I wrote a comment and WordPress ate it! Annoying! Thank you for the shout-out and hurrah for Liberty! I think you could possibly squeeze a sleeveless version of the dress I made from 2.5m (depending on what size you need) and the other dress you’d be sure to get out of 2.5m is a Christine Haynes Emery dress. Happy sewing! Great minds think alike! Although I am not yet sure whether the Coco pattern is in the book or separate? Lovely fabric – haven’t bought Liberty for years but may have to take another look. Just off to check out those blogs you mention…. Thanks! You really should check it out, just incase! So many beautiful designs and not as pricey as you might think.